During late 80s, he played in a local electronic band (Jesus Blood), using self built analog and digital synthesizers. 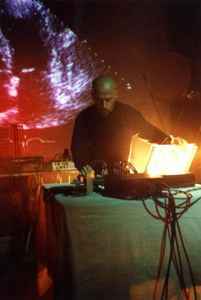 Besides these activities in 1992 he created his Bad Sector musical project, trying to discover dark sonic areas and focusing his attention on the melting point between ambient, experimental, noise and minimal music. He has released various CDs and vinyls, always having good responses from international underground electronic music magazines and listeners. As Bad Sector, he performed live in Italy, France, England, Germany, Czech rep., Austria, Belgium, Australia and Russia. Beside Bad Sector, in 2001 Magrini formed the project Olhon, together with the Where leading member Zairo. This project explores the territories between dark ambient and concrete experimental music using sounds recorded in extreme locations (caves, underwater etc.). During 2002 he also started a collaboration with the Italian video-artist Giacomo Verde, creating the multimedia group called XEAR and working on interactive installations / electronic-theater scores. I'm still working my way through his (massive) discography, but I have to say - this guy's music is truly exceptional and unique. There's not a whole lot to compare it to. Yes, it's "dark ambient" or "ambient industrial" or whatever, but it exceeds the stereotypes and conventions of those genres with ease. I'd say that Bad Sector's music is "cinematic" but I feel as though that would diminish its power. Cinematic music is enslaved to the image on the screen and few "soundtrack" albums, in my opinion, overcome that limitation and stand on their own feet and with their own power. Glass's 'Mishima' and Geinoh Yamashirogumi's Akira OST come to mind, in that regard. Bad Sector's music is better than that common stereotype of cinematic music. It's evocative, it's imagistic, it's pregnant with imaginal seeds which get planted and grow into their own ideas; their own narratives. I think this is why so many others (and myself, in the past) have suggested that his music is "cinematic" - but unlike a truly cinematic album, Bad Sector hints at a vague plethora of other places, states, and modes of being; and lets you do the work of constructing them, rather than simply anchoring and making concrete someone else's vision. His music suggests a polyvalent story capable of simultaneously divergent fractal narratives and you owe it to yourself to listen to him. I'm rather fond of Toroidal Body, the Dolmen 7", and Ampos, but there's a lot of music here and I can't claim to have heard it all. Probably the most intense and emotional dark ambient music ever created. Deep, seducing melodies for cyborgs and androids living in a distant future on an Earth covered in radiocative dust. Yes, I'm thinking of "Blade Runner" or, better, "Do Androids Dream of Electric Sheeps?". I'd love to listen to Bad Sector scoring Ridley Scott's movie! A true genius, and a very humble person as well. A true genius. Bad Sector's otherworldly music crosses and melds genres (industrial, noise, ambient, electronica, experimental) and he creates genuinely scary and beautiful music that must be heard to be believed.